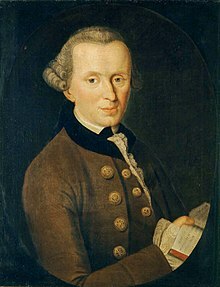 A 1768 portrait of German philosopher Immanuel Kant by Johann Gottlieb Becker, collection of the Schiller-Nationalmuseum, Marbach am Neckar, Baden-Württemberg, Germany. Kant coined the German word Abderitismus, from which abderitism is derived. From German Abderitismus, from Abderit (“foolish person”) +‎ -ismus (“-ism”), from Ancient Greek Ἀβδηρῑ́της (Abdērī́tēs, “Abderite”) because of the Abderites’ famed foolishness and stupidity in classical Greece. It is equivalent to Abderite +‎ -ism. The German term was coined by the philosopher Immanuel Kant (1724–1804) in Der Streit der Fakultäten (The Conflict of the Faculties, 1798). (philosophy) The theory that humanity's morality will never advance beyond its present state. This one example of Abderitism will suffice for my present purpose, though innumerable instances might be produced in other departments. The Anarchist-eaters believe to have executed a master-stroke of Abderitism by turning national muttonhead and laying the blame for Anarchism at the door of foreigners. […] Kant posed the critical problems of historical prediction and, in passing, unwittingly provided us with a convenient framework for an examination of the debate on moral progress in one of its most original forms—the German Enlightenment. He acknowledged three current popular hypotheses with respect to philosophical theory and the future moral nature of man: […] The first he called "moral terrorism," the second "eudaemonism," and the third "abderitism." The dialogue "Stilpon" presents the reader with a purely negative view of abderitism. Coming to an end thus becomes an interminable and inconsistent process, a process Kant gives the rather silly name "Abderitism" in order to capture its lack of seriousness. Kant contrasted this theory with both moral terrorism, the theory that human morality is degrading continually towards depravity, and eudaemonism, the theory that human morality continually progresses towards universal happiness.